Home Architecture Los Angeles Conservancy Marks LGBT Month with a Map to Gay L.A. The Los Angeles Conservancy explores LGBTQ Historic Places in L.A. with a new interactive map and microsite that’s part of their ongoing “Curating the City” programming. More than 30 locations ranging from architectural masterpieces like Frank Lloyd Wright’s Samuel-Novarro Residence in Los Feliz to an absolutely anonymous storefront in Boyle Heights that housed the popular lesbian bar Redz for more than 50 years. 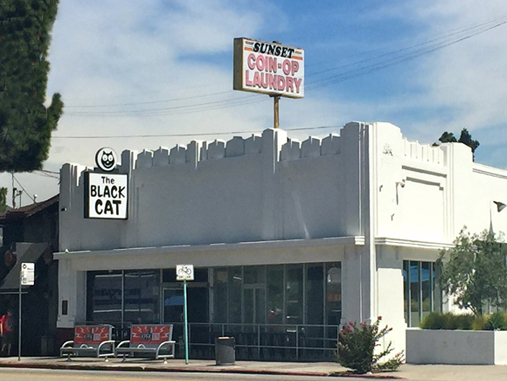 Some of the locations, including the Black Cat bar in Silver Lake and the modernist residence of Margaret and Harry Hay, are officially listed as city monuments for their LGBT history. Los Angeles was home to the first gay pride parade in 1970, the world’s first LGBTQ synagogue, the oldest continuously operating Christian LGBTQ ministry, and the country’s longest-running LGBTQ publication. The national LGBT history month organization is also marking the month by honoring Angelenos including Angelina Jolie, basketball star Jason Collins, music producer Clive Davis, tennis player William “Big Bill” Tilden II on their list of 2015 icons.